Botanical Beauty Organic Monoi de Tahiti Oil Butter VIRGIN, UNREFINED is an extraordinary oil for face, body, hair, lip and nail care. ORGANIC MONOI de TAHITI TIARE BUTTER UNSENTED 100 % Natural UNSENTED. 4 Fl.oz.- 120 ml. One of the most extraordinary butters for skin and hair care with Tiare flowers infusion. ORGANIC MONOI de TAHITI TIARE BUTTER 100 % Natural 4 Fl.oz.- 120 ml. ORGANIC MONOI de TAHITI TIARE BUTTER 100 % Natural 8 Fl.oz.- 240 ml. 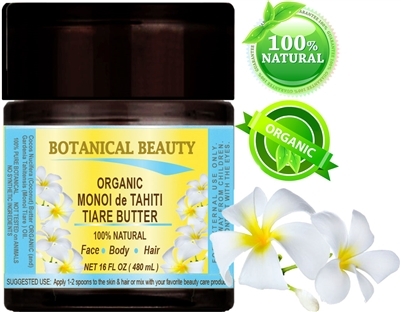 ORGANIC MONOI de TAHITI TIARE BUTTER 100 % Natural 16 Fl.oz.- 480 ml.